Hempel/Blakes Dura-Gloss Varnish is a single pack, urethane modified alkyd with excellent resistance to alcohol and cleaning materials. Quick drying to an extremely hard and durable high gloss surface, which is highly resistant to wear and abrasion within hours of application - it's ideal for inside and outside areas where the varnish needs to be beautiful and durable. Use inside and outside above the waterline. Dura-Satin Varnish is a satin finish version for areas where a satin finish is required instead of high gloss. Hempel Favourite Varnish is a single pack, alkyd based, full bodied, high gloss varnish. Especially easy to use, giving a tough, durable finish with depth of gloss and longevity of life. Ideal for areas where structural flexibility of the wood is required. For internal and external use above the waterline. If overcoating times are exceeded, abrade the surface and wash off with fresh water. 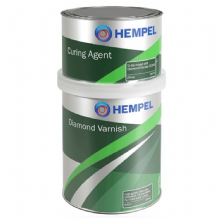 Hempel Diamond Varnish is a clear non-yellowing two-component polyurethane varnish. It gives a durable, mirrorlike finish, resistant to weathering. A two component polyurethane varnish. Use inside and outside above the waterline. Use where a hard, extremely durable and long lasting finish is required. Highly resistant to abrasion and chemicals, for the ultimate finish in durability and beauty. For professional use only. A two-part varnish with a 2:1 ratio. 500ml Varnish with 250ml curing agent. Wood Impreg is a clear alkyd oil for use on wooden boats and hardwood. 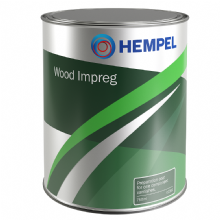 Excellent penetration properties allows the oil to saturate the wood before application of Hempel’s varnishes and paints. For internal and external use above the waterline.